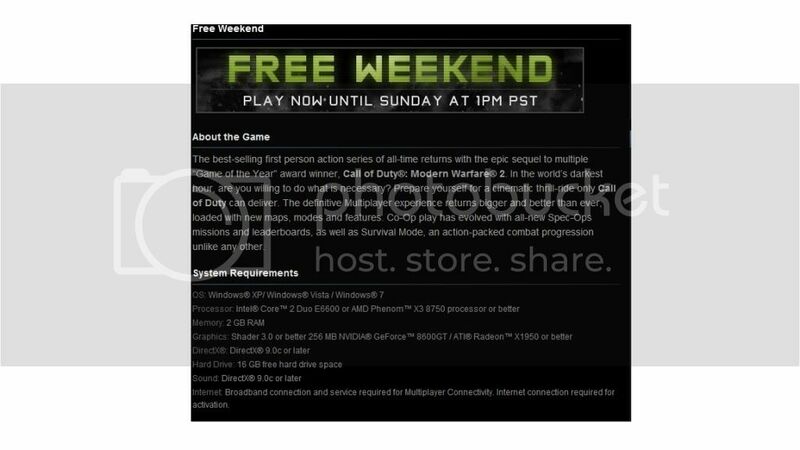 As title says Modern warfare 3 is free until THIS sunday 1pm est on steam so for anyone wanting to try out mw3 heres your chance. SOAP dies at the end. I played it this weekend to try it out. The game itself is very cool, addicting and visually stunning (the weapons visuals are almost the same as MW2, but it seems to be that the skinned hands were pretty much photo-realistic). 1) - Lack of maps (only a handful amount of them, I was expecting much more). 2) - Censorship. One of the things I love in UT is that you have lots of gore. In MW3, no matter what you do the guys always end in 1 piece, they never get ripped apart even if you explode them directly. The game would be way more fun if it had gore (they wanted to make it realistic, yet they missed this part). 3) - It's so goddamn easy for upper levels to get killstreaks, and it's very hard to take them out, yet it's so easy to get lots of kills with them. Since they detect the best hosts automatically, they should only join people of around the same level and not mix level 80 with level 1 guys, or perhaps making that mix an option for who wants to play that way. I mean, what chance do anyone stand against a thermal high-firerate sniper with pro perks on it while you only have a pre-selected ones of the lowest level with low accuracy assault rife or sub machine gun? The result is guys of level 1 being raped with level 80 guys, making them leave (and no, deathstreaks do not help anything at all, what do you do with 10 seconds of extra speed?). So basically, in this game, if the level 1 guy has the same skill of a level 80, the level 1 will be raped, and now consider this: level 1 guys are actual noobs and level 80 are already pros in the game, so the gap is even bigger that makes gameplay insanely unfair. Anyway, I went to level 42 myself during the free weekend, and was a fun experience overall, despite the flaws it has, it's a game worth buying imho (won't buy it though lol, no money, it's still too expensive for me rofl).